SwissOne Capital approaches the young crypto market with veteran authority. Our team boasts decades at the helm of successful fund management, with niche experience in alternative assets. SwissOne Capital believes cryptocurrency represents an exciting diversification for the modern portfolio, and our investment funds deliver professional entry points. For clients, this means infallible asset security, a fully compliant regulatory structure, and skilful allocations. Capitalising on innovation need not be an amateur venture. Incisive research and risk management always directs our strategies. We’re invested in the market and believe in our offering. Blockchain’s multi-industry potential and cryptocurrency’s asymmetric returns paint a picture of expansion. 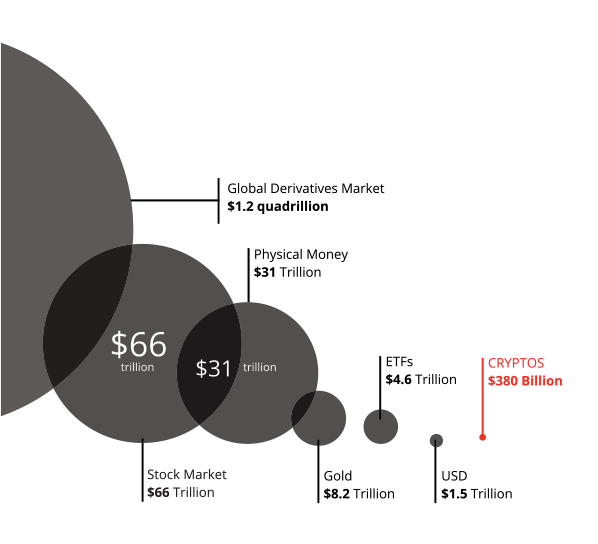 Currently, crypto occupies just 0.2% of the market capitalisation of all assets, leaving room for significant growth. Further, with uncorrelated characteristics, cryptocurrency adds compelling diversity to portfolios. Impassioned by and familiar with the process of innovation, we guide investors safely to this emergent asset class. With the launch of our flagship fund, a crypto smart index, SwissOne Capital will offer broad exposure to cryptocurrency. Follow us on social media for details on our upcoming index fund and for critical industry insight.